As fuel prices hit record highs around the world, interest in fuel saving tips and techniques has rocketed. Protests and broken government promises have been futile in bringing down fuel duty so motorists are taking the matter into their own hands. 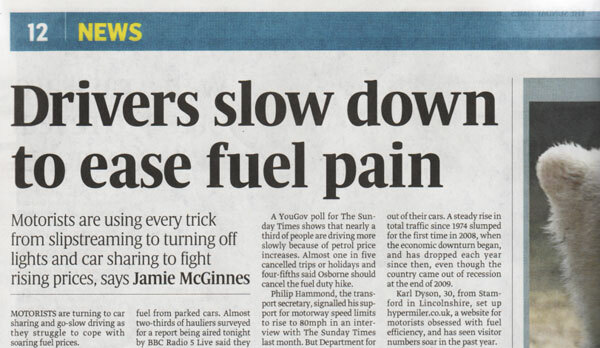 We have been fortunate enough to be featured in the Sunday Times who’s artcle discussed fuel save measures motorists are tuning to in order to help fight fuel prices. Click for the Sunday Times article in PDF format. Are you really saving money by choosing a Diesel? ‹ Hypermiler.co.uk MPG Calculator app hits the app store… we rejoice! !